Ashok Bajaj of Knightsbridge Restaurant Group, is pleased to announce the appointment of Bryan Moscatello as the new executive chef at 701 Restaurant. Moscatello brings twenty-eight years of experience to his new position having worked at esteemed restaurants throughout Washington, DC, Napa Valley, Aspen, Colorado and Chicago, Illinois. Guests can look forward to exciting new additions on Chef Moscatello’s late spring menu such as American Allium Soup with green garlic and ramp veloute, whipped oma cheese and pickled green onion; Blood Orange Glazed Spanish Octopus with fresh anise, citrus, caper vinaigrette and salsify; Sun Choke Tortellini with espelette jus, charred spinach and lemon sabayon; Saint Alban Ravioli with preserved tomato, toasted brioche sauce and sorrel, as well as Chesapeake Rockfish with gnocchi, smoked mussel glaze, chorizo, rouille and tomato confit. 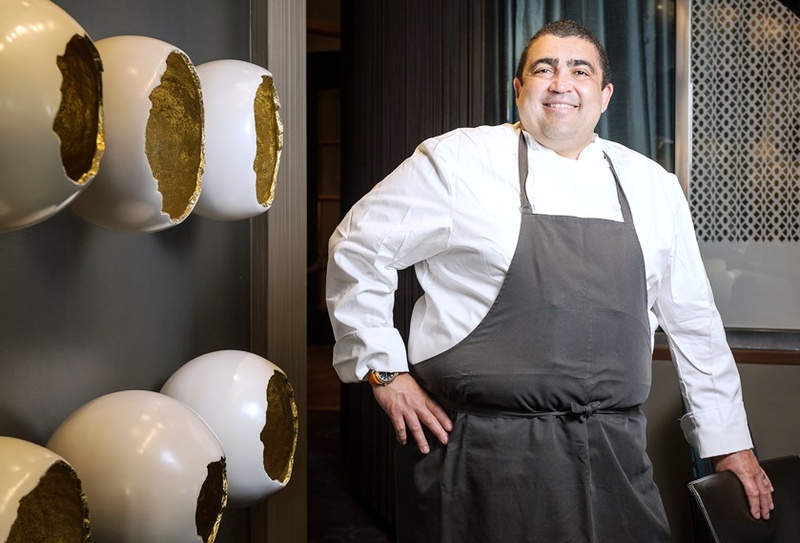 Prior to joining 701 Restaurant, Chef Moscatello served for two years as executive chef of the award-winning Calistoga Ranch in Napa Valley, part of the esteemed, five-star Auberge Resorts Collection, where he oversaw the culinary operations for the property including The Lakehouse restaurant. From 2014 to 2015, Moscatello served as executive chef at The Little Nell in Aspen, Colorado, where he gained a Forbes Five-Star award in 2015 for Element 47 and oversaw all culinary operations including seven world-class dining and beverage venues at the AAA Five Diamond hotel. Prior to this appointment, he served as a chef-partner of the Storefront Company restaurant in Chicago, Illinois, from 2011 to 2014. Here he developed a modern head-to-tail farm cuisine concept, while also separately serving as culinary director of Tenzing Wine & Spirits. During his two-year tenure, the restaurant received three stars and was named “A hidden gem, in plain sight,” from restaurant critic Phil Vettel of the Chicago Tribune as well as a Michelin Bib Gourmand accolade. Before his move to Chicago, Moscatello served as executive chef for Stir Food Group where he honed his farm-to-table philosophy and cultivating relationships with area farmers serving the Washington. DC region. In his five years with this restaurant group, he opened, operated, and spearheaded culinary programs for Zola, Zola Wine & Kitchen, Potenza Trattoria, Potenza Bakery and Potenza Wine, Spy City Café, as well as handling the special events and catering at the International Spy Museum. Prior to Stir Food Group, Moscatello notably served as executive chef of Denver’s Adega Restaurant + Wine Bar, introducing local guests and national media to his bold approach to American cuisine. Moscatello and Adega received widespread recognition and acclaim, including being named to the list of Esquire magazine’s “Best New Restaurants in the Country” in 2002, one of Food & Wine magazine’s 2003 “Best New Chefs in America,” and “2003 Chef of the Year” from Denver’s 5280 magazine. 701 Pennsylvania Avenue, NW, 20004. For additional information, call (202) 393-0701 or visit the website at www.701restaurant.com.